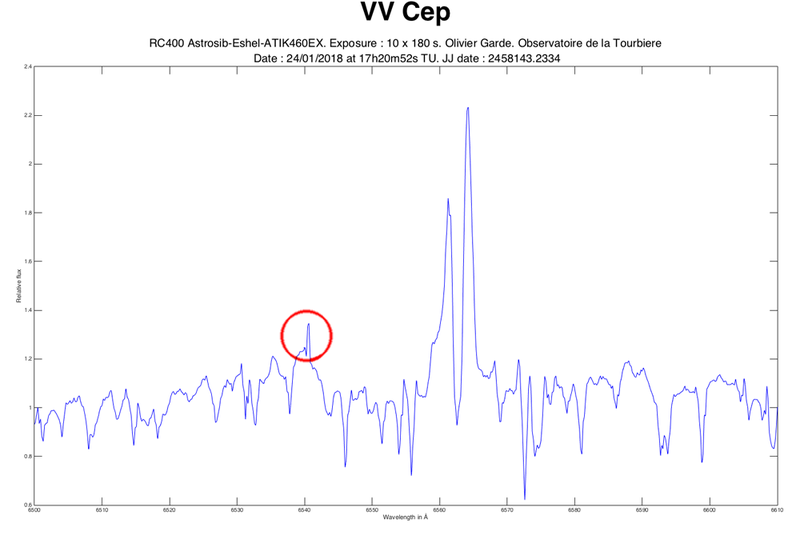 spectro-aras.com • View topic - VV Cep emission line near 6540 Å ? 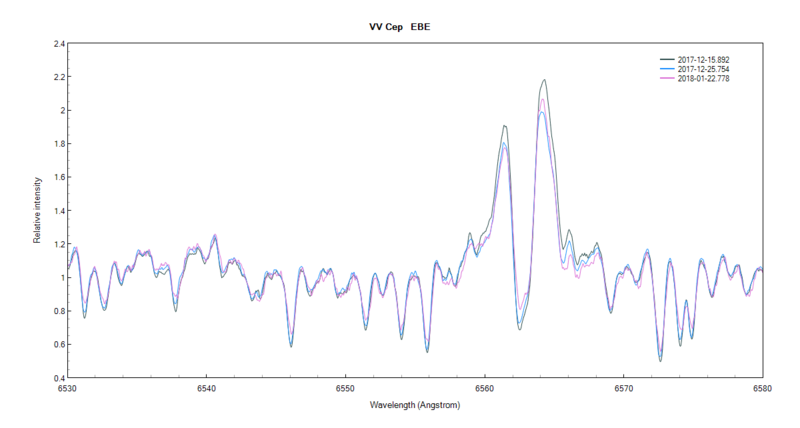 VV Cep emission line near 6540 Å ? Just to check if it's a hot pixel or a real emission line : do you know if this line is real or not ? Are there any other people who did VV Cep about the same date ? Re: VV Cep emission line near 6540 Å ? 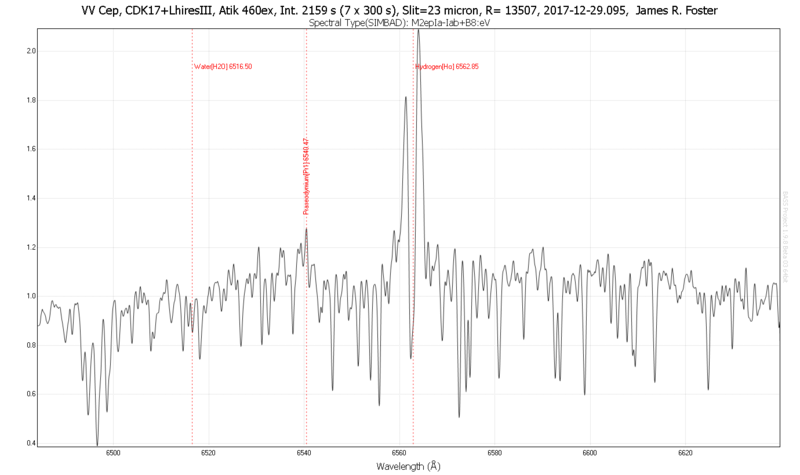 Oliver, it seems to show in Etienne's spectra posted on 25th, see his post . La raie d'émission sur ton spectre est pile à 6540A ? Sur mes spectres elle y est à 6540.61A et à 6539.95A c'est la raie d'absorption qui s'y trouve. Cette raie est présente sur des spectres de Décembre. Can someone explain the astrophysics of what's going on here ? 59 (cerium ← praseodymium → neodymium)! My guess would be Fe II] 6541.3569. Fe is abundant, and mostly present as Fe II (Fe+). The upper level of this line is at 102824 cm^-1, which is nearly coincident with the upper level of Lyman-gamma at 972.5368 A. In this situation, Lyman-gamma could pump the upper level of this Fe II line, giving rise to an emission feature. This is just a guess -- I'm not aware of this line being seen elsewhere. Heliocentrically uncorrected all for now, I've shifted mu. Cep using ISIS->Misc->Radial velocity tool to align the actual VV Cep here. The ratio difference is below noise I think (above 1 hour exposure for VV Cep that time, mu. Cep is only 3 minute but also noiseless, say SNR > 100), or it may also come from the fact that B component was not subtracted for now, as I neglected that small elevation when B was still up. The narrow peaks on the ratio unfortunately all correlate with tellurics places (and their tiny shift when aligning both stars), so no real difference. Of course, any real change is still possible since 2017 aug, I just wanted to point out here that feature is also existing on mu Cep. To show and quantitize weak differences, I recommend subtracting a properly aligned mu. Cep (attaching here my example: R~26000 - you need to shift it and decrease resolution for your spectrum), or someone need to get an alpha Ori. Subtracting mu cep also reveals noise level (including continuum reproduceability errors), making it out easy e.g. whether it falls under such an error level (e.g. resolution change) or this was a real change. All the shift, B comp. elevation (should affect small, or none today - see BAV Umag curve whether needed), subtraction are easy to do in ISIS for anyone, who feels there was such a change to present it.